We use our Droid cell phones for Internet browsing, email, Facebook, Google Earth, and many other data applications. We *Love* it! So we were quite distressed this summer when, in Bowling Green Kentucky, they did not work. Voice service was fine, but there was simply NO data service. We called Verizon and were told, very apologetically that, indeed there was no data service in Bowling Green, Kentucky (and much of Kentucky.) Luckily there was Wi-Fi in the RV park where we stayed. But wait! We met people who had Verizon data cards and they were online just fine. What the …? We soon moved on from southern Kentucky, and our data service returned to normal thru most of our travels this summer, but that discrepancy kept haunting me. If data cards could get service, there’s *got* to be a setting somewhere on the Droid to allow access to data service. The next time we experienced the lack of 3G connection was in Mary Hill, Washington. I talked to someone else in the campground who was using a Verizon Mi-Fi very happily, yet I had no Internet connection on my Droid. I hunted thru all the settings until I happened upon the ‘Data Roaming’ setting. Oh – that sounds promising! Turning it on produced a scary “You may incur significant roaming charges” message. But I tried it anyway, deciding I would quickly turn it off and check my bill at the end of the month to see if there were charges. It worked! I was browsing the web, checking email and posting to Facebook. I turned off Data Roaming, and was back to no 3G service. I didn’t use Data Roaming again for the rest of the month. My bill showed no extra charges. 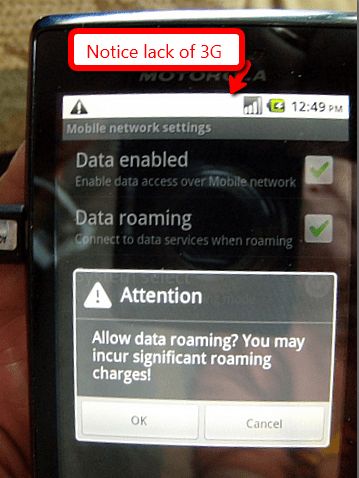 I researched the issue and found discussions that the data cards have the Data Roaming setting always On. All comments I read indicated that roaming charges will only apply if you’re not in the United States. I still couldn’t be sure this was the answer to our Bowling Green issue unless I could test it. So, I was thrilled when our route took us thru Bowling Green again yesterday. Sure enough, No 3G service turned into full 3G service by turning on the Data Roaming feature. Published by MrsGeek, in Blog. Tagged with Geeks on Tour, Motorola Droid, Verizon Broadband. I have a htc Droid I got from Verizon. Will it work the same as your Motorola? Thanks for this information. I guess you leave the data roaming off until you need it. Thanks for the follow up. I’m very glad to hear that it works without charges. I turned mine on too.